⬅ What if I Mess My Kid Up? Getting to the bottom of our emotional reactions to our kids can be difficult. The heat of the moment can cause us to do things we said we would never do. And it has taken me a long time to understand these reactions even in myself. Years, in fact. If I’m feeling something going on inside of me, my tendency now is to get to the bottom of it and understand why I feel the way I feel. And then make amends with my kids if I’ve responded in an unhealthy way. I’ve learned that rather than listening to my feelings, I need to put my prefrontal cortex (thinking brain) in charge. I’m finding that I’m better at it now — well at least most of the time. But at times I’ll admit that anger, frustration, or fear will well up within me and I have to fight it back. It’s a skill. It is an awareness. And it doesn’t typically come naturally to any of us unless we’ve seen it modeled. That’s what puts many of us as parents at a deficit as to what to do with our emotion and what to do with our kids’ emotions. Typically it becomes a standoff. We tend to match our child’s emotional level trying to get them to “hear” us. The next step becomes the escalating shouting match. And it hurts the relationship. Parents from my generation usually didn’t give much thought to how a child felt in the moment. I’m guessing most of us have heard the proverbial “sit down and shut up” or “will you just be quiet” or “stop crying”. Maybe we’ve even said it to our kids when we’re exhausted and don’t think we can take the whine another minute. Yes, our child might calm down in the moment, but we’re setting them up for future emotional outbursts. The goal of helping us and our kids become more aware of our independent feelings is so that we lessen their sometimes destructive hold on us. There is a case study conducted by a UCLA professor that showed that awareness and naming our feelings lightens the emotion and actually makes us happier. Who doesn’t want happy kids? What I’ve discovered through working with moms is that sitting in the emotional ‘spin’ of our child actually helps contain them. What I mean by that is that by validating that it is okay for our child to feel the way they feel helps them accept themselves and love themselves in the moment despite how they feel. It doesn’t matter that what they did was hurtful or disrespectful or uncalled for. It doesn’t matter that they aren’t handling themselves in a mature fashion. What matters is that they know that in the moment when they feel out of control, that they are loved and everything will be okay. When we validate our child we’re communicating that they are valued and precious even in the moment they are in. It says that we love them even when they are spewing all over everyone else. A hug, looking them in the eye, and sitting with them holding their hand and offering tissues helps them know that someone is there to help them deal with the pain of the situation even when it might seem totally uncalled for to us. We need to recognize that their feelings are their feelings. Our job is to just be there for them in their moment. Let’s say your 14 year old comes in after school, slams the back door, fails to take his muddy shoes off as he walks across the carpet. When you ask him what is wrong, he shouts, “I hate you”, and then proceeds to slam his bedroom door breaking the hinge in the process. Wearing his muddy shoes on the carpet. Shouting “I hate you” which hurts us deeply. We focus on what happened rather than what our child is feeling. When we put the emphasis on what was done wrong, we fail to get to the root of our teen’s feelings–the heart of the issue. When we react in a harsh way, “How dare you speak to me like that” or “You are going to have to pay to repair this door” or “Come clean up this carpet right now”, we’re focusing on what was done to us not what is going on inside our teen. By ignoring the reason for the outburst and not letting them vent in the moment, we are teaching our teens to either stuff and ignore their feelings or that their feelings don’t matter. Research is showing that these are the very things that trigger addictions — emotional pain that the teen isn’t able to contain. When feelings become overwhelming and aren’t understood, more and more teens start medicating to deal with feelings they want to get rid of. When we choose to be in their moment and help contain them, we are lightening their emotional load. We’re letting them see that nothing is wrong with those feelings and we’re here for them. I’ve sat with moms who have shared the frustration of not being able to connect with their adopted children as they become teens. The hurt and feeling of abandonment of a teen can be overwhelming. Dealing with the fact that they were given away can bring much pain deeply rooted in who they are. The same goes for the girl who has become an outcast in her circle of friends or the boy who doesn’t measure up in sports or has a creative bent unlike his male peers. The teen years are a time of self-discovery as they try to figure out who they are. It’s a time when they need to be nurtured–not taken to task for the things they do or don’t do. Spending time in their emotional world and teaching them to self-process their feelings will help them move from emotional “doom and gloom” to “this will all blow over and I’ll be okay”. It will allow your teen to move the situation from their emotional brain to their thinking brain which moves them toward maturity. Once you’ve helped them, then and only then is it time to help them cognitively process the muddy carpet, the harsh words spoken in anger, and the broken hinge — in a gentle, matter of fact way. Wouldn’t it be great if even as adults we could quickly move from the emotion to mature logical thinking? What if we could give the other person the benefit of the doubt instead of spinning in their emotion getting caught up in the other person’s level of anger? Wouldn’t it be satisfying to realize that instead of heaping our emotions on top of an already volatile emotional situation we could help soothe the other person in such a way that we both felt good about ourselves and our relationship? Dare you to think about the emotional situations in your own home. Are you responding to your child’s emotional fire in a healthy way? If you’ve been around awhile, you know that Greater Impact is all about relationship training. 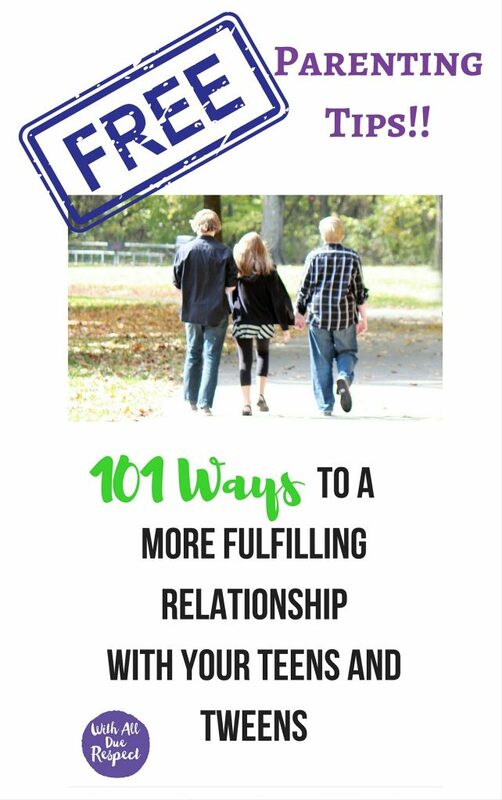 Whether you go through the book With All Due Respect: 40 Days to a More Fulfilling Relationship with Your Teens and Tweens or another one of our courses, the foundation elements include resolving conflict and strengthening the relationship in a healthy way. 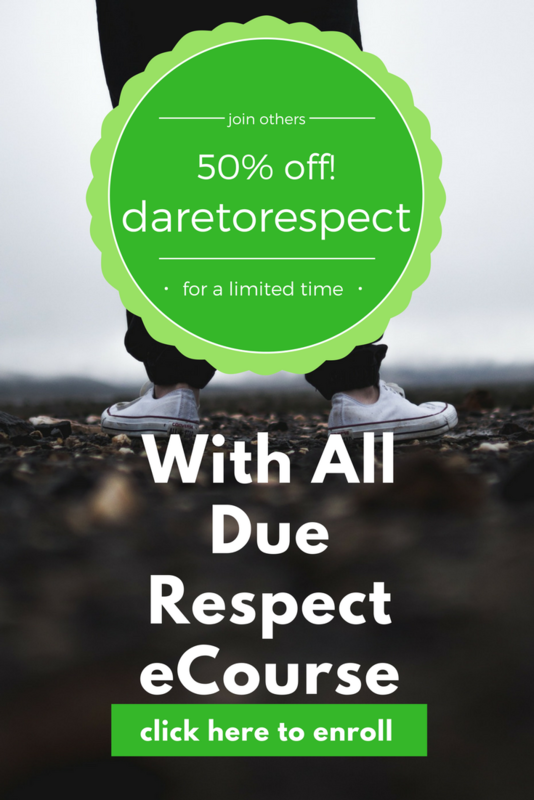 Our courses draw you closer to God and others and do so in a way where you can maintain self-respect in the process. It’s at the core of everything we do. 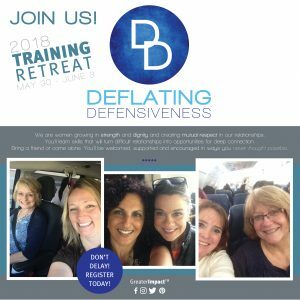 Our Deflating Defensiveness Training Retreat is coming up at the end of May near Cincinnati, Ohio. This conflict resolution workshop is not only a sweet time of fellowship with God as women from across the country learn how to interact in a healthy way with other family members who are emotionally hurting, but will give you the skills and confidence to enter into the fray of conflict with a whole new outcome. You’ll learn how to contain the other person’s emotions. We’ve been told that families are changing because of what women have learned in this workshop. We hope you will consider joining us. Shirley, thank you for being on this journey with me. I’m glad that you are finding my blog helpful. Actually we are considering the possibility of taping the Deflating Defensiveness Training Retreat so that we can use parts of it along with a live on-line session for people who can’t attend. Keep watching for updates on that in the months to come. We’re trying out some different technology now to see what might work best. We’re hoping to have something available on-line in 2019.